Skin, cartilage, and meat were removed from pork hock bones after the pork hocks were cooked in a pressure cooker and the bones were allowed to dry. They were then burnt in a wood stove until all carbon-containing organic substances had been oxidized. The images shown precede that stage and still show carbonization. The longest bone fragment in this image was 105 mm long. The joint structures are more clearly visible from the two smaller bone fragments. 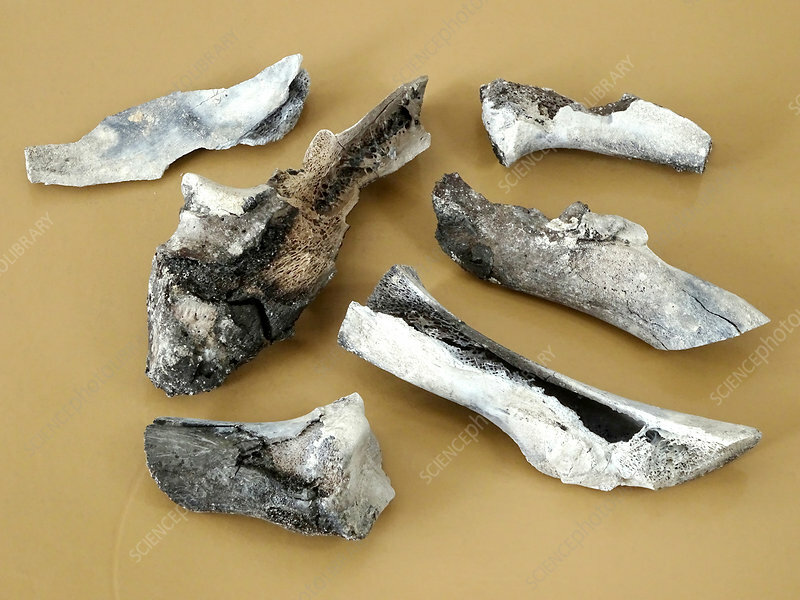 Animal bones may be used as a source of the fertilizer phosphorus in the form of calcium phosphate. Burnt bones are of interest to forensic investigators as well as those involved in the cremation of human bodies. Alterations occur in the bones during the burning process, affecting coloration, weight, shrinkage, deformation, fragmentation, and DNA survival. Micro-computed tomography imaging is being used as an advanced technique for burnt bone identification and anthropological analysis.